« All that Black Friday shopping makes for a great Saturday run. Yep, here it is folks. 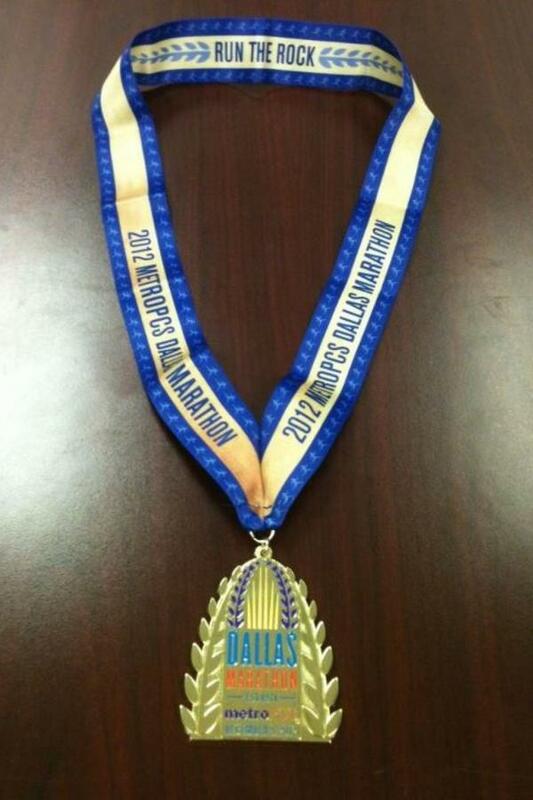 Another runner that I follow on Twitter posted this pic of the finisher’s medal for this year’s MetroPCS Dallas Marathon. I finished my last long run yesterday for my training plan and only have a few short easy runs and some rest days before race day on December 9th. In addition to getting ready for this race and thinking back over all the training I’ve done, I thought some this week about my cross-training. After having several injuries mostly relating to over-used or inflamed muscles and tendons, I learned about cross-training. Of course, as a cyclist, I was cross-training already, but since then, I’ve added in swimming as well. My cross-training with running really helps with my muscles. I can always tell after riding, spinning, or swimming how much looser my muscles feel. This has to be good for my running and I think it has helped. Along with remembering to stretch after long or hard runs, I haven’t (knock on wood) had any issues this year after my swimming injury healed. I’m getting just a little bit excited to run come Sunday. Now the really obsessive part of racing takes hold. Checking on the weather every five minutes. Pouring over the race map to visualize the race neighborhoods and where I’ll be at about what time. Figuring out six days in advance what I’ll wear and need, then changing it several times. Fretting over meals and calorie counts. If I forget anything to be obsessive about, please send me a comment and remind me. I don’t want to miss even the smallest obsessive detail you know. I pulled the marathon card on my algebra teacher this week. I signed up to take college algebra this semester as I need more discipline hours in order to be able to teach on the college level someday. Wouldn’t you know I’d pick math, right. I have this saying, “Dave always has to do it the hard way.” And, I’ve proven it with math. I’ve really struggled this semester with this course, which shouldn’t be all that hard. I took algebra in high school, right; thirty something years ago. Mostly, I seem to have some kind of numerical dyslexia. My difficulties are often in getting all the numbers written down without transposing something. In any case, I spent all day yesterday doing two tests, and I do mean all day. I’ve been close to giving up and withdrawing. Instead, I sent my teacher an e-mail and told her I was a marathoner. We don’t give up. And, I wont’. Might go down in flames, but I wont’ give up. If you already have a follow for me on Twitter, I’ve set up tweets while I’m running next Sunday. If you haven’t and if you’re really that bored for tweets on Sunday, I’m @abigmanrunning over there. Strangely enough I do have followers on Twitter as well as here on WordPress. I thank you for that. I started writing this for practice, but I realize it’s writing and we do like for folks to actually read what we’ve written. I found out how important that was this week when I helped out another writer. Discovered a new app to use this week. Another friend messaged me about using Strava for cycling and running. My garmin has been broken for all of this Fall. I just haven’t wanted to spend the money on a new one nor mess with it while training. Mostly, I just need an easy way to record my miles, times, and paces. I’ve been using another app on my android phone, but it’s really a power hog. Strava so far doesn’t seem to be. I’ve only gotten to use it once, but it’s really simple. It works while my phone is in airport mode. The GPS signal still receives during that mode, but it really lowers power usage. I’ll keep everyone posted on it. Well, I told you it was going to be a bit random. It happens every now and then. I just heard today there are chances of rain showers for next Sunday. I don’t need to hear that after last year’s race. I sure hope that goes away. I’ll be updating on the post race recap next week, after I rest up a bit. Remember, the first 20 miles is a training run. The last 6.2 miles is the race. I think I said that somewhere before. Merry Christmas, and Happy Running!